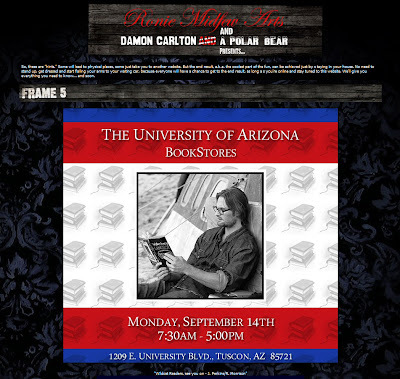 The final frame 5 clue, and it is the bookstore at the University of Arizona where the URL will be revealed. Thanks to Vud in the comments for being the first to report this. 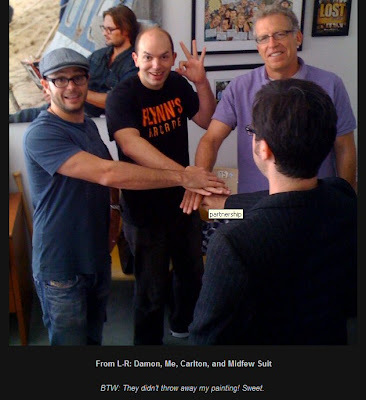 Incidentally the picture on the hub page is the same as the picture that is haning in Damon and Carltons office in the handshake picture. Posting for email to defeat the block at work. Whoa, I just got a time-zone headache. Just to warn those on email, I'm going to put an 'As it Happens' post up about and hour before the event is due to start. And a great CST-morning to all. It's poster day! Thank you Zort!....oh, uh email!!! Does this mean we're getting a Sawyer poster? Cool. Maybe instead of Sawyer it will be of all the books that have ever been on the show. As promised above a NEW POST to chronicale the events of today. Is anyone else, apart from CerberusVenting, going to the event today ?